There is probably no point in my going into your questions now; for what I could say about your tendency to doubt or about your inability to bring your outer and inner lives into harmony or about all the other thing that oppress you - : is just what I have already said: just the wish that you may find in yourself enough patience to endure and enough simplicity to have faith; that you may gain more and more confidence in what is difficult and in your solitude among other people. And as for the rest, let life happen to you. Believe me: life is in the right, always. People have already had to rethink so many concepts of motion, and they will also gradually come to realize that what we call fate does not come into us from the outside, but emerges from us. Wanting to change, to improve, a person's situation means offering him, for difficulties in which he is practiced and experienced, other difficulties that will find him perhaps even more bewildered. That is the principal thing-not to remain with the dream, with the intention, with the being-in-the-mood, but always forcibly to convert it all into things. For poems are not, as people think, simply emotions (one has emotions early enough)-they are experiences. Live the questions now. Perhaps you will then gradually, without noticing it, live along some distant day into the answer. I am a house gutted by fire where only the guilty sometimes sleep before the punishment that devours them hounds them out in the open. All this hurrying soon will be over. Only when we tarry do we touch the holy. Death is the side of life which is turned away from us. There are quite a number of people in the reading-room; but one is not aware of them. They are inside the books. They move, sometimes, within the pages like sleepers turning over between two dreams. Ah, how good it is to be among people who are reading. It almost seems as if autumn were the true creator, more creative than the spring, which is too even-toned, more creative when it comes with its will-to-change and shatters the much too ready-made, self-satisfied and really almost bourgeois-complacent image of summer. Extinguish my eyes, I'll go on seeing you. Seal my ears, I'll go on hearing you. And without feet I can make my way to you, without a mouth I can swear your name. Break off my arms, I'll take hold of you with my heart as with a hand. Stop my heart, and my brain will start to beat. And if you consume my brain with fire, I'll feel you burn in every drop of my blood. I could give you no advice but this: to go into yourself and to explore the depths where your life wells forth. Look, lovers: almost separately they come towards us through the flowery grass and slowly; parting's so far from thought of, they indulge the extravagance of walking unembraced. 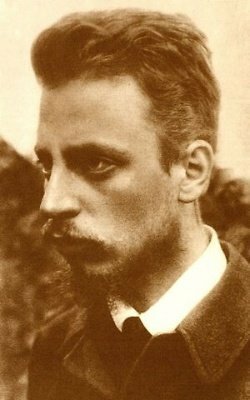 Bio: René Karl Wilhelm Johann Josef Maria Rilke better known as Rainer Maria Rilke was a Bohemian-Austrian poet and novelist, "widely recognized as one of the most lyrically intense German-language poets", writing in both verse and highly lyrical prose.